No more crawling over your tools or equipment. Put them where you can reach them. Making it easy on your knees or back. Keep your job or adventure organized and efficient. Sturdy steel frame construction. Real plywood deck with a laminated surface for strength and durability. Ball bearings provide dependable lasting support. Aluminum side rails with a slot style tie down track on all three side. Includes 4 tie down eyebolts to make securing cargo easy and versatile. CargoGlide Wall Slide allows everything stored on a fixed shelf, drawer, or bin to roll out 100%. This enables the back of any van to carry large capacities of weight. CargoGlide Wall Slides can be manually or automatically driven! You will never have to get in and out of the back of your vehicle again, this significantly reduces the risk of injury and drastically improves the efficiency of your work vehicle. Bins and shelves can be easily mounted the the wall sliding system. CargoGlide Wall Slides offer premium organization and orderly storage for diverse equipment, tools and packages. The TruckVault that started it all. Whether storing hunting rifles, fishing rods or SWAT equipment, the original TruckVault has stood the test of time. 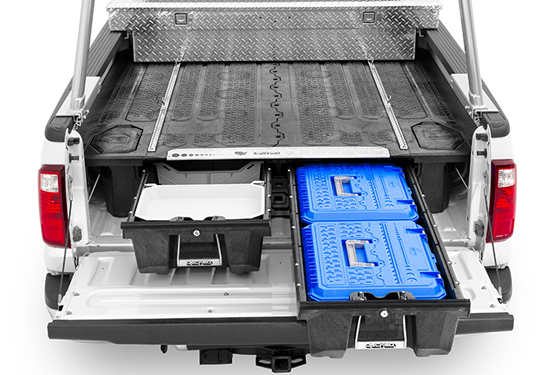 Featuring additional side compartments for extra storage for pickups multiplies your storage capability while keeping everything safe and out of sight. Strong enough to allow you to haul the rest of your gear on top. PLAY HARDER: Fishing, hunting, camping, boating, tools, sports gear – you name it! DECKED maximizes the flexibility of your vehicle’s bed and keeps it dry, secure and organized. With a system payload of 2000 lbs. and 200 lbs. per drawer capacity at a total product weight of only 220-230 lbs. (depending on model).